This die set is so versatile. It can be used for almost any theme you want. I always recommend that you watch Karen’s: Spinner Square Pop Up assembly video It will really help you make the “spinner mechanism” work properly the very first time. Step 1: I chose a digital designer paper from a shop on Etsy called “The Digi Rainbow” that’s called 100 Number Digital Papers. Yes, there are 100 different colors of this same paper that’s included in the Sale price of $1.40 for all of the colors! What? I used this blue one for the front, the inside left, and the back of the card. Step 2: I stenciled some clouds on the right inside as well as some die cut clouds from a set that has been discontinued. Once colored, I fussy cut the “couple flying in the plane” to spin up on the square when the card is opened. This week’s challenge was a fun card to make. This week was also a week that one of my customers at the beauty salon was moving to a memory care facility. I’ve been doing her hair for probably 8 – 10 yrs. She’s in her 90’s now and one of the sweetest blessings in my life. . I decided to make this card for her when I go visit at her new home. Cut the pcs. 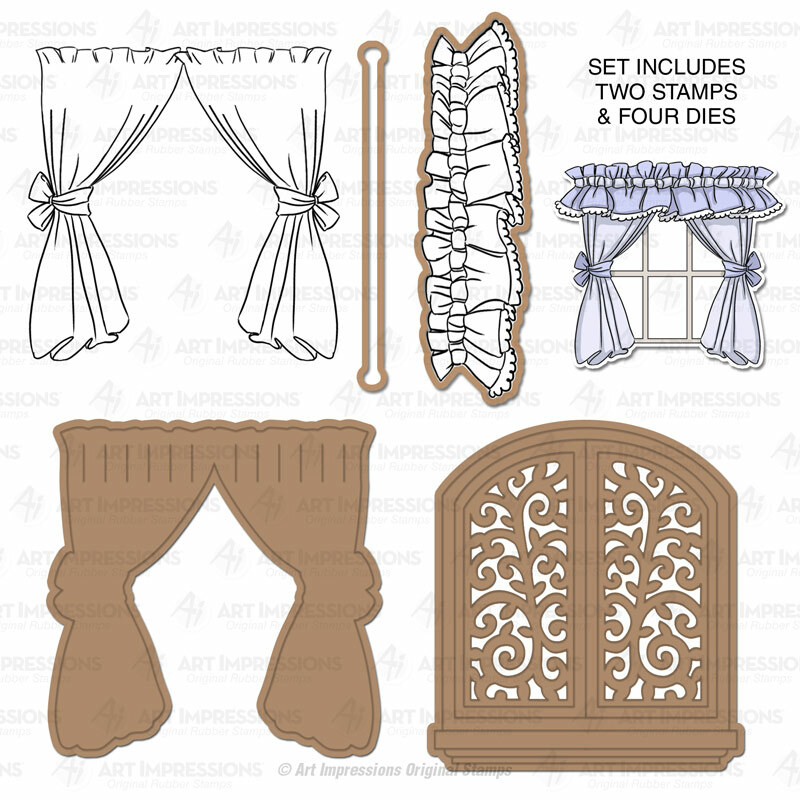 in this die set the is the 4 pane widow, shutters, window topper and window planter from white cardstock. Cut enough of the roses and leaves to make 3 rose bushes. I cut the “rose spiral” pcs. from pink cardstock and the leaves from green cardstock. Step 4: Make a base card by scoring an 8.5 x 11″ pc. of pink cardstock at 5.5″ fold over for a book fold card. Trim to 4.5 x 5.75″. Adhere this to the base card centering it with an 1/8″ margin on all sides. Step 6: Cut the colored AI stamped and colored to measure 2 3/8 x 3 1/4″. Step 7: Assemble the window. Cut a transparency film that also measure 2 3/8 x 3 1/4″. Glue the transparency film to the underside of the window. Add the 3 rose bushes as shown. Put foam adhesive dots on the underside of the window around the window frame. Now adhere the window to the AI stamped and trimmed pc. Step 8: Add the sentiments “Miss You” and “XOXO” as shown. (See other products used) The ivy, bird and tiny lady bug are optional but are also in other products. Thank you so very much for taking a look. I hope you will take the challenge and show us your window masterpiece! You all know how much I love a sketch but I must admit this sketch stumped me. It looks so easy but I couldn’t come up with an idea! I am currently working on Easter so I wanted to use my favorite bunny stamp. It’s from Art Impressions and is called Holiday 1-779. This is how I made this card. Step 1: Stamp on white cardstock using the above stamp. Color with Copic Markers or Pencils. I chose to color with copics. (When you position the stamp give yourself about 3″ below the top of your cardstock. Step 2: Cut the image with the largest die from this set. This step is actually two steps because these nested fishtails are too short for what I needed to fit the sketch. Position the die on your stamped and colored image where you want the “fish tail” (bottom) of the die to end below your stamped image. Run through your cutting machine but STOP before the top (straight edge) of the die cuts. Now move the die up to where you want the top of the die to end. In this case that was 2″ above the image. Now run through your cutting machine again but stop before it cuts the fishtail again. You should now have a longer fishtail then the die. Notice that I positioned the image closer to the left of the die to allow room for the half oval in the sketch. Step 3: Using the stamp set below from Pink and Main, stamp both the “egg” and the “Chocolate bunny box” 3 times. Color how you want. I added Crystal Lacquer to the bunny boxes like they were wrapped in cellophane. After the lacquer is dried, fussy cut all the bunny box and eggs. Step 5: Using the same Pink and Main Stamp as in step 3, stamp Happy Easter on white cardstock. Cut it with the long rectangle pictured below and distress the edges with Tim Holtz “peacock feathers” Distress Ink. Glue the grass Strip (which is a Silhouette file to the top of this sentiment strip. Step 6: Cut the 3 bunnies from this die set below using 3 different brown colors. I used scrap cardstock. Add a glitter dot for eyes. Cut an oval with coordinating designer and the second to the largest die set pictured below. Cut the oval in by first laying in place and making light pencil marks where one side should be cut off to make it line up with the mat’s edge as shown. Score a pc. of 11 x 8.5″ white cardstock at 5.5″ on the long side. Trim to 5 x 7″. Cut two mats from designer cardstock that measures 4.75″ x 6.75″. Adhere one to the card front and one to the back, centered leaving 1/8″ border all around. Adhere the stamped fish tail to the front panel, centered with the top (Short straight edge) at the top of the designer paper mat. Adhere, the now cut oval in place as shown. Put 3 large foam dots under the sentiment tag by centering the one dot then adding one either side of the first. Put the dots closer to the bottom then the top to make it possible to side the bunnies behind the grass. Glue the two ends down. Add a half dome pearl to cover the hole on the right and adhere the Easter basket as shown with the highest bunny box hiding the left side hole. Thank you so much for your time to hop over for a look. Please follow if you would like more tutorials. I’m branching out and trying to enter more challenges this year. I have found that they are a great way to challenge yourself. I work as a hairdresser for an upscale retirement community and have spent the last couple of weeks making birthday cards for the residents to give to one of their neighbors for their birthday. I have collected a lot of Art Impression stamps especially in the groups they call “Golden Oldies” and “Girlfriends“. This particular stamp is one I have had for many years. I think it was the first one I bought. It’s called “Fred and Millie Q1244“. I just love this sweet scene of these two sitting on a bench. We have a bench just like this one where I work and have often seen one or two of our residents sitting on it. We’re in California, in the Bay Area, and we don’t see snow but it does get chilly. Of course, I first stamped the image and then colored it with Copic Markers. Since the couple are on a bench I knew I wanted the card to look as if the view was looking at them through a window. The base of the card measures 5.5″ x 7″ and is white cardstock. I made a double frame by using three Spellbinders Nested rectangles from their set called “Card Creater“. It has eight dies in the set. I use this set a lot. I simply nested a smaller die inside of a larger die so that it created a frame when it was cut. Then I repeated the same process for another frame. I glued the smaller frame to the larger one so that it sort of looked like window molding. I felt that my scene needed a winter tree so I used the “All Seasons Tree” by Karen Burniston for Elizabeth Craft Designs and didn’t add any leaves or flowers dies that come with this die set but I did use the die as a stencil to make the black lines on the tree. I used a gray cardstock to cut the tree. I then positioned the tree inside the double frame where I liked it in my little scene and cut off some branches to fit. Once I had my scene completed I felt it needed drapes to look more like a window instead of just a matted picture. Luckily, I found a brown cardstock and a printed designer paper that worked together in my stash. I cut a piece of the dotted designer paper 5″ x 12″ and then just scored it in quarter inch increments all across the 12″ piece of cut paper. When you score the paper you need to flip the paper over at every other score so that you are able to pleat it easily. I then cut two pieces of pleated paper the size I needed for my curtains. My finished 2 pleated panels measure 5″ x 1″each. The sentiment tag was made by first in Word on my computer and then cut with the smallest rectangle die in the same Spellbinder set. Thanks for taking a look.